Being too busy to understand your backup strategy, is like being too busy to put on the seat belt when driving a car. 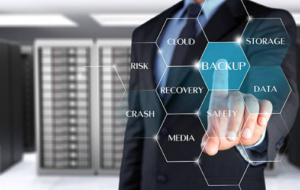 Backup Strategies have evolved significantly over the last few years, and despite their importance, companies in the SME market space often don’t have a good understanding of their existing backup strategy and what protection it actually offers them in certain situations. In a lot of cases it’s ‘Oh Yeah, we have backups’ without understanding exactly what is being backed up and how, and what that means in different scenarios. We estimate that as many as 45% of companies we interact with aren’t adequately protected from the general day to day risks of data loss, despite their strong belief that they are. It’s not until it’s too late, that questions start being asked. With threats like encryption viruses at an all time high, everyone has heard the stories of companies being caught with inadequate strategies. We offer a backup strategy that combines both a Managed Online & Managed On Premise backup service. As a unified solution both the Online & On Premise backups stay synchronized with each other and it provides for fast restoration of files from a local source when required as well as protection and additional options to restore from the cloud (which is an Australian Data Centre) in times of serious disasters. The solutions can include everything from entire server images down to individual application databases. Our process involves implementing a NAS onsite for the On Premise backup and we initially send you some hard drives for an initial backup to the cloud. These drives are returned to our office where we upload them to the cloud servers via fast internet connections. We then activate the service and from that point on only the changes in the data are backed up each night, although all data can be restored at any point in time. This reduces the amount of data required to travel up to the data center each night. We also offer continuous restore options, where companies can keep separate servers on standby that are continuously updated and kept in sync with their main servers. All backups are reported back to us via a managed online dashboard that tells us the status of each back and these are manually checked 3 times a week by an engineer to ensure no issues have arisen. While we all understand that automated notifications can be sent about backup statuses, it important for a manual audit to also take place. We also offer to test the restore of a file sample from the backups on a monthly or quarterly basis, because this is the only way that anyone can be sure a backup is working successfully. For a free evaluation of your existing backup strategy please make contact with us, and even if you don’t end up using our service, we are happy to give you some free advice. Our Managed Online Backup Terms and Conditions can be found here.